What will become of our favorite e-commerce platform? Will Magento become completely profitable? Will it become a proprietary solution like most Adobe products? Before answering, a brief overview of the conference. This convention took place at the Barcelona Convention Centre on 9 and 10 October. After the free shower provided by the bad weather, we pick up our badges and go hunting for goodies from the various sponsors/partners in the main hall. 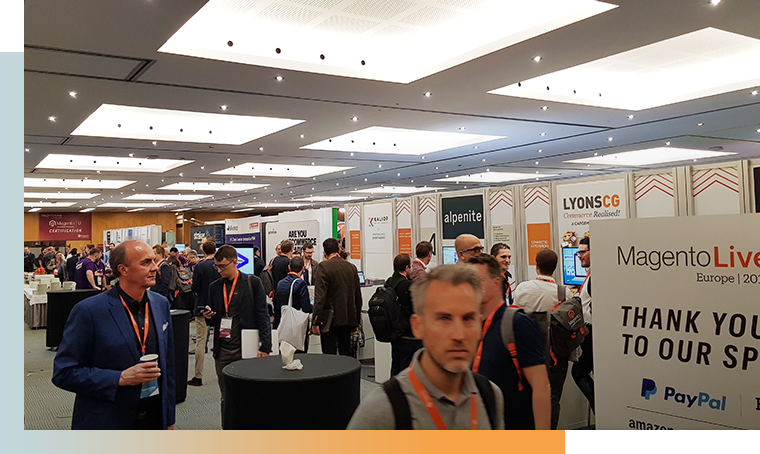 The 2 days were structured around 30 minutes of micro-conferences on various topics oriented B2B, Business, Strategy, Technique etc… followed by a 15 minutes break to meet the sponsors and engage in networking. Finally, we had 2 Keynotes to talk about Magento more generally. 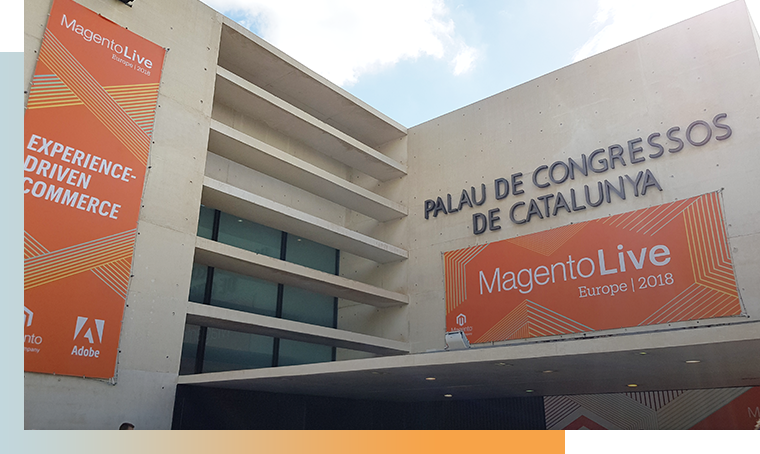 After a musical and local introduction, we get to the heart of the matter with the presentation of Shantanu Narayen, CEO of Adobe, who first of all wants to reassure us that Magento will remain Open Source. He knows very well that a large majority of his products are proprietary, but he is also aware of the importance of the community within Magento. Moreover, it is mainly thanks to this community that the e-commerce tool is evolving so quickly. Since the announcement of the acquisition, contributions to GitHub have increased steadily. Adobe thus confirms its commitment to its new Open Source acquisition. But then what are the changes? If Magento remains Open Source, how does it relate to other Adobe products? This link will be made on the Commerce Cloud version of Magento. 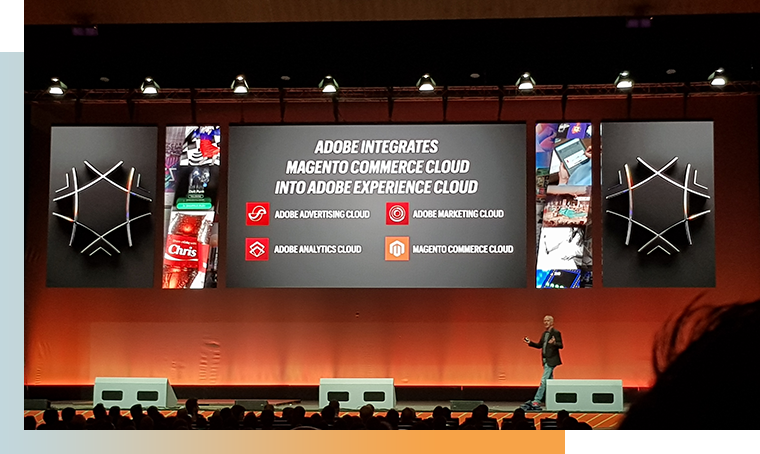 Adobe plans to integrate Magento Commerce Cloud into its “Adobe Experience Cloud” tool suite, which includes “Adobe Advertising”, “Adobe Marketing” and “Adobe Analytics”. These tools make it possible to analyse customers and their behaviour, manage advertising space and marketing campaigns. There are many applications and for the moment they are still being considered, as this acquisition is still very recent. 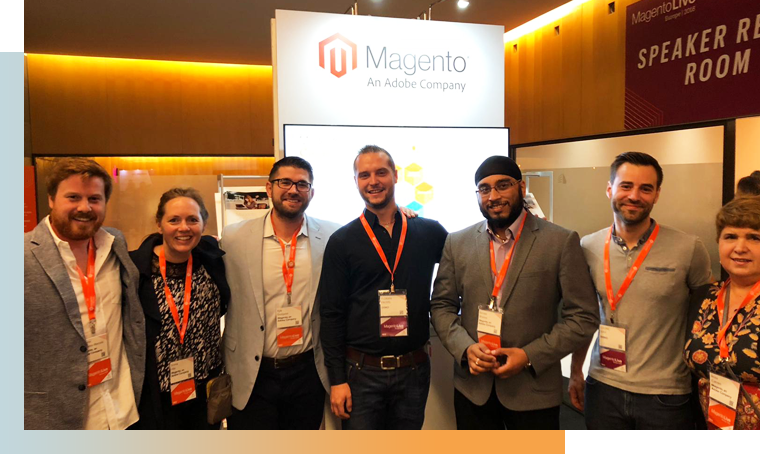 But the Magento teams made it clear that they were very excited about all the possibilities that the Adobe suite products would offer them. The main goal is to create a brand new shopping experience, by customizing each customer experience for the one who will be browsing the E-commerce platform, and by anticipating their needs and desires. It is then easy to imagine a website selling shoes online that highlights on its homepage comfortable Charentaise shoes for the 50-year-old housewife, while it will display the latest trendy sports shoes for the young dynamic sportswoman. Magento 2.3 the new features! The new version of the platform will be full of new features. Some will be exclusive to the Commerce version, others will be directly integrated into the free version (Open Source). 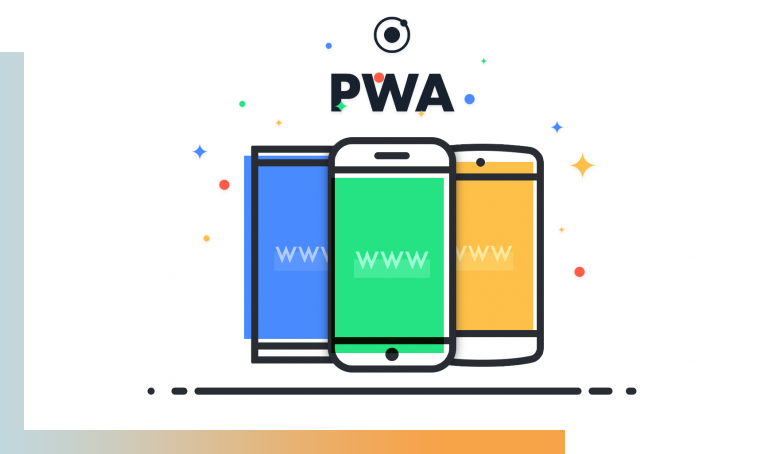 A new way to develop the front office via a new tool (PWA Studio), in order to offer a fast mobile interface with features close to an application. FINALLY! That was the first word that came to mind during the presentation. Indeed, it will now be possible to manage several stocks produced within the same catalogue. This (paid) feature is already available since 2.2, but improvements are planned for the next release to display more information in this analysis tool. GraphQL -> Flexible and powerful API (created and used by Facebook) to simplify the creation of a frontend. -> Performance improvement: reduction of indexing time by nearly 60%. That’s great, but when does it happen? To date we still do not have a precise date, but a regularly updated address to watch for information…. Thus we can see that the beta is already available which suggests a stable release for the end of the year or early 2019. In addition, in order to be transparent with the community, Magento makes its backlog publicly available. Be careful though, as they have pointed out many times, this is a backlog and NOT a roadmap. So, what can we learn from these two days? Yes, Adobe acquired Magento to integrate it into its Experience Cloud software suite. 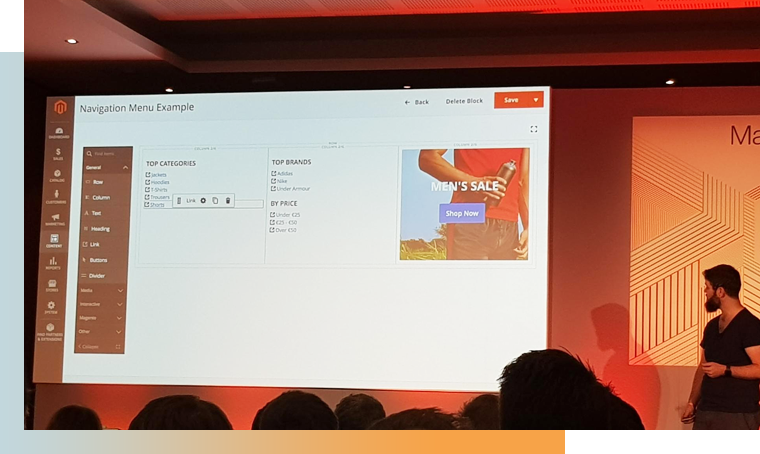 Yes, Adobe will connect Magento with its analysis, marketing and prediction tools to improve the user experience and make marketing easier for merchants. But, a priori NO, Magento will not become a proprietary solution. The Open Source version will not disappear, and even it could hardly disappear. Why? Why? Quite simply because several functionalities, such as Multi-Source Inventory or asynchronous APIs, were projects carried out exclusively by the community and not by Magento. It would therefore be inappropriate to make a solution developed in part by contributors who are not remunerated by the company profitable. Certainly, there will always be exclusive features on the Commerce and Cloud version, but as is currently the case, some features can be palliated by community extensions or specific development. According to Adobe at this Magento Live, Magento 2 is not about to die, and promises many beautiful things for the future.